The Canadian Consumer Price Index (CPI) was released last Friday, and it continued the trend of remaining well below the Bank of Canada target of 2%. This was not too surprising, so I will instead examine the behaviour of food inflation in some more detail. Although I will look at Canadian data in this post, the behaviour is similar in other developed countries. What we see is that following social trends can be increasingly expensive. The Food component of CPI is broken up into two sub-components: food from stores, and food from restaurants. One obvious observation is that eating in a restaurant is more expensive than cooking the same meal at home. However, eating in restaurants has also become relatively more expensive over time. The chart above shows the behaviour of the store-bought food and restaurant components of the CPI. The top panel shows the annual inflation rates since 1994. Restaurant prices are only infrequently changed, and so the inflation rate is less volatile than prices in grocery stores. 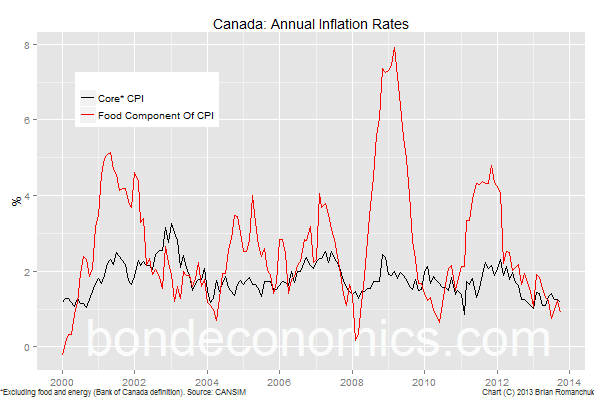 However, restaurant owners have tended to ignore Canada’s 2% CPI inflation objective. Additionally, the surge in grocery store prices in 2008-2009 stands out, and did not really reverse afterwards. The second panel shows the same two sub-component indices, measured in constant (1961) dollars. (This is calculated by taking the component index and dividing by the overall CPI index, and multiplying it by the factor that sets the new index to 100 on January 1961.) What this measures is how these sub-components move relative to the overall CPI basket. The chart shows that restaurant prices have been rising relative to the overall price index for several decades, while grocery store prices have not risen much relative to the overall index. Although restaurants have become relatively more expensive than food from grocery stores, the percentage of time people dine out has been rising, not falling. (Unfortunately, I could not find the history of the consumption weights, so that is an assertion on my part.) This means that consumers are substituting towards the relatively more expensive eating option over time (which is the opposite of what is often assumed in some areas of economic analysis). This behaviour is explained by rising real incomes; consumers have more money to spend, so that they can afford to take the more expensive option more often. Another way to look at this: firms that produce goods or services that are popular have more pricing power, and so they can make above average price hikes stick. And this principle appears to hold across other classes of consumer goods. I noted one interesting thing when looking at the Statistics Canada data. They publish the prices of some generic goods on a monthly basis. 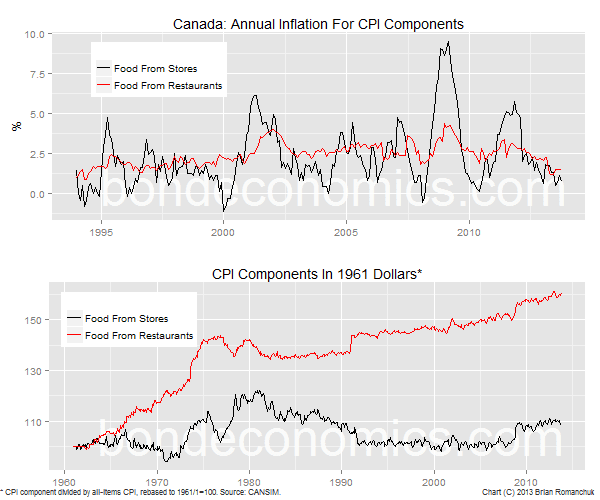 This is useful, as you can compare their data to your personal experience, while the CPI index numbers cannot be related to. What I found is that even within the category "beef", there was some fairly impressive divergence of relative inflation rates. Between June 1995 and October 2013, ground beef prices rose at an annual rate of 5.2% (prices rose by a factor of 2.53x) , whereas round steak prices only rose at 1.8% annualised (1.41x). This shows the uselessness of personal anecdotes to draw conclusions about the validity of CPI statistics (which is a very popular pastime on the internet). The price of one type of beef rose at less than the 2% target over the past 18 years, whereas another beef product had an inflation rate more than double that target. If you just cherry pick a few atypical examples, you can probably conclude almost whatever you want about the price level. This pricing dynamic has unwelcome implications for consumers who want to follow social trends. The goods and services that you buy will be increasingly weighted towards those goods that are rising faster than the overall CPI index. Since a lot of people follow social trends (almost by definition), this may explain why a lot of people complain why their personal cost-of-living is running well above the official CPI inflation rates. Inflation assumptions in personal finance plans should probably be nudged upwards relative to what is expected for CPI inflation. For example, even if you believe that the Bank of Canada can hit its inflation target of 2%, you probably still need to factor in a faster rate of increase in your personal cost-of-living. Indexed pensions or inflation-linked bonds will probably suffer some slippage versus your cost-of-living over a long time period. If you want to control costs, it may be an idea to develop a habit to avoid following the herd. And finally, since we are talking about food, it is probably a good time to wish my American readers a good Thanksgiving holiday. Maybe more people are dining out now as a result of how expensive groceries were relative to dining a few years ago. Habits and rhythms move slower maybe? Possibly. But there's a lot more working single people, and couples who both work. They are busier, so they have less time to cook.